A new flush mounting system to dock and fully integrate your Apple iPad Air or 9.7-in Pro into your aircraft instrument panel. 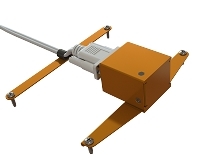 Now Approved for Installation in Certified Aircraft and Rotorcraft! iPad (A1822, A1823) - Modification to mount using included kit must be made for proper fit - see drawing in "Manuals / Drawings" tab for details. The smartPanel Mount for Apple iPad Air (1 & 2) and iPad Pro 9.7-in is a new flush mounting system to easily dock and seamlessly integrate your existing iPad into your aircraft instrument panel -- giving it a clean, professional appearance in an easy to view position! Once installed, the smartPanel mount allows your iPad to be docked in seconds, fully connected to power and audio with built-in cable ports. Removal is just as easy -- just slide, push, and remove! The thin and powerful iPad Air 2 and the new iPad Pro 9.7-in model are becoming very popular in aviation with ample screen size for viewing and a bright Retina display for superior visibility in even the brightest of cockpits. The smartPanel Mount for iPad Air & Pro 9.7-in brings that functionality and performance within easy reach and sight, beautifully transforming your new or existing panel. All smartPanel Mounts from Guardian Avionics are approved for installation in certified aircraft and rotorcraft under 14 CFR Part 23, 27 and 29 as "Non-Required Safety Enhancing Equipment" (NORSEE) as outlined in FAA memorandum number PS-AIR-21.8-1602. Mounts and power supplies may be installed as a minor alteration. Please refer to this link for the Guardian Avionics NORSEE Letter of Authorization. Designed with General Aviation in mind. 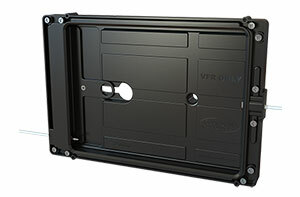 The smartPanel Mount for iPad Air and Pro 9.7-in was designed by aerospace engineers to perform in the unique environment of the cockpit. The spring actuated mounting cradle securely holds the iPad in place during the roughest of turbulence. The clean, flush mount has a shallow chassis allowing it to be easily installed in even the smallest of instrument panels. Built-in ports for the Apple Lightning plug and a 3.5mm audio cable help keep cables safely and securely positioned behind the panel, allowing you the ability to connect to power, data, and audio without the cord mess. As they are being used, iPads generate heat that can affect performance -- resulting in a high-temperature shut down when you might need it most! Pilots have found this out the hard way when using a temporary mounting solution like Velcro to attach their unit to the instrument panel. The smartPanel Mount was designed with cooling in mind. Each mount has a 5/8â€ tapered hose / tube port built-in, allowing you to attach it to a standard avionics cooling fan. Each panel mounting tray features cooling channels to circulate air behind your iPad to keep it cool even under the heaviest of use. The smartPanel Mount is designed for easy installation in your panel. Each durable molded ABS plastic unit is self-contained and mounts with only four screws. Our installation drawings give you the exact panel cutout details and screw positions in either PDF or AutoCAD DXF for precise cuts. The smartPanel Mount for iPad Air and Pro 9.7-in requires a 9.485" long and 7.057" high panel cutout and can be mounted either horizontally or vertically. Mount in Automobiles, Boats, RVs, and Displays Too! Though the smartPanel Mount for iPad Air / Pro was designed for use in aircraft, the durable construction and well-designed flush mount can be used easily for a wide variety of applications -- wherever there is a flat surface! Automobile - A great custom dashboard mount for custom cars, auto restorations, or to incorporate into your own upgrade design to customize your car or truck. An easy way to add a clean and custom navigation display in any vehicle! Marine / Boats - The thin profile flush mount works well to create a custom bridge display in your boat, yacht, or watercraft for charts, weather, and navigation information. Mount in the wall of your cabin for a space-saving entertainment / communication / information system! Recreational Vehicles (RVs) and Campers - Create a custom mount in the wall of your trailer, RV, or mobile home to have a simple entertainment and communication system while saving space! Displays / Office / Home Use - An easy-to-install custom flush mount to add to trade show displays, retail kiosks, educational exhibits, home entertainment systems, and home management systems. View all of our videos on our YouTube video channel. All products come with a 60-day money back guarantee and a one (1) year limited warranty. The warranty will be void if the unit has been opened or tampered with. If you experience any problems with the unit, please call 520-889-1177 or email us at [email protected] and we will gladly assist you and have the problem rectified. GUARDIAN AVIONICS/CO GUARDIAN LLC. WARRANTS TO THE ORIGINAL CONSUMER PURCHASER, THAT THIS DETECTOR WILL BE FREE OF DEFECTS IN MATERIAL AND WORKMANSHIP FOR A TO REPLACEMENT OF THE PRODUCT, REPAIR OF THE PRODUCT OR REPLACEMENT OF THE PRODUCT WITH REPAIRED PRODUCT AT THE DISCRETION OF THE MANUFACTURER. THIS WARRANTY IS VOID IF THE PRODUCT HAS BEEN DAMAGED BY ACCIDENT, UNREASONABLE USE, NEGLECT, TAMPERING OR OTHER CAUSES NOT ARISING FROM DEFECTS IN MATERIAL OR WORKMANSHIP. THIS WARRANTY EXTENDS TO THE ORIGINAL CONSUMER PURCHASER OF THE PRODUCT ONLY. Any implied warranties arising out of this sale, including but not limited to the implied warranties of description, merchantability and fitness for a particular purpose, are limited in duration to the above warranty period. In no event shall the Manufacturer be liable for loss of use of this product or for any indirect, special, incidental or consequential damages, or costs, or expenses incurred by the consumer or any other user of this product, whether due to a breach of contract, negligence, strict liability in tort or otherwise. The manufacturer shall have no liability for any personal injury, property damage or any special, incidental, contingent or consequential damage of any kind resulting from gas leakage, fire or explosion. Some states do not allow limitations on how long an implied warranty lasts, so the above limitation may not apply to you. Some states do not allow the exclusion or limitation of consequential or incidental damages, so the above limitations or exclusions may not apply to you. Please note that Guardian Avionics is not responsible for loss and/or damages resulting from installation or soldering errors. During the above warranty period, your product will be replaced with a comparable product if the defective product is returned, postage prepaid, to Guardian Avionics, Customer Service Department, 1951 East Airport Drive, Tucson, AZ 85756, together with proof of purchase date. Please include a note describing the problem when you return the unit. The replacement product will be in warranty for the remainder of the original warranty period or for six months, whichever is longer. Other than the cost of postage, no charge will be made for replacement of the defective product. Important: Do not attempt to open unit. If unit is opened, warranty will be void. Your Carbon Monoxide Alarm is not a substitute for property, disability, life or other insurance of any kind. Appropriate insurance coverage is your responsibility. Consult your insurance agent. CO Guardian LLC dba Guardian Avionics. Your unit has a Serial Number. Please check that the unit you receive has the same serial number as shown in your invoice.